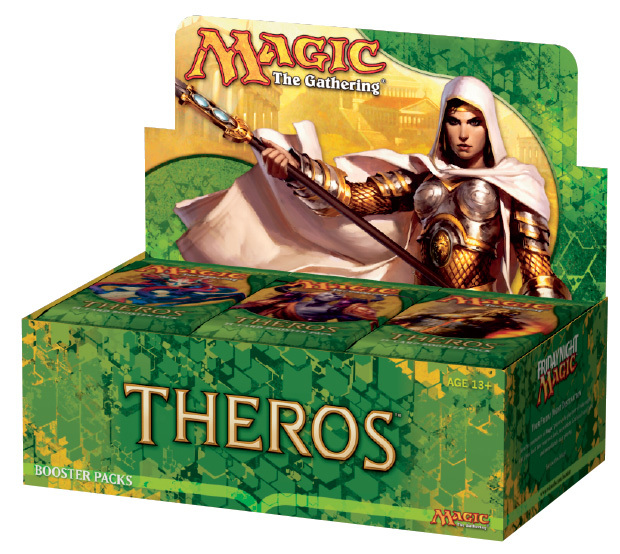 Wizards of the Coast has revealed the Theros packaging, which means we get five spoiler cards from the Intro Packs. 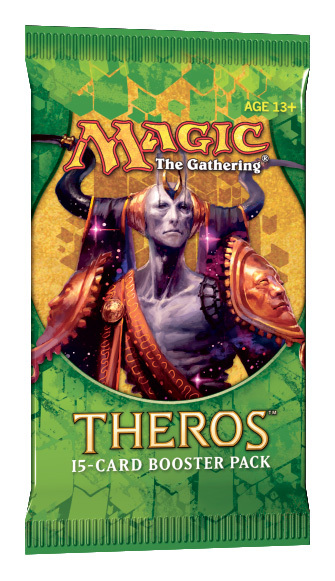 So here we have Thassa, Erebos, Purphoros, Elspeth, and a mystery card art. An Enchantment that is also a Creature. So how does this work you may ask? 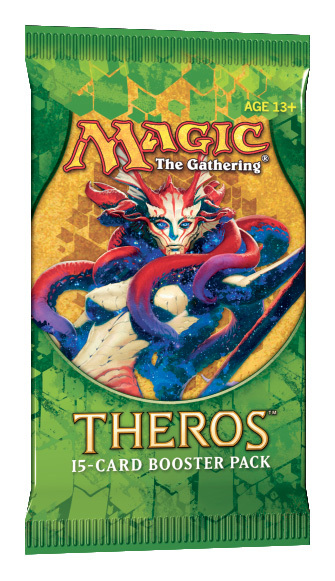 If you pay the regular cost of 3WW, you have a 4/4 Creature with flying and first strike. 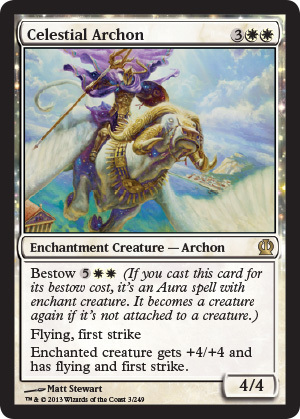 If you pay the Bestow cost of 5WW, you have an enchantment that gives the enchanted creature +4/+4, flying, and first strike. 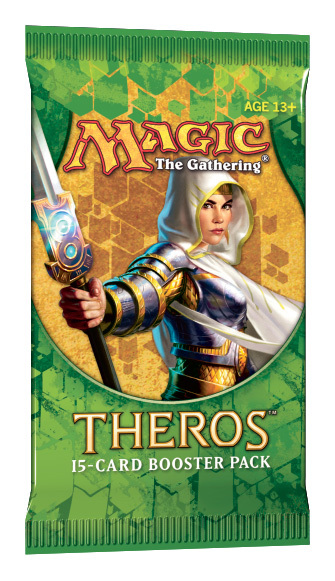 This seems like a pretty cool card. So this is a pretty powerful card. 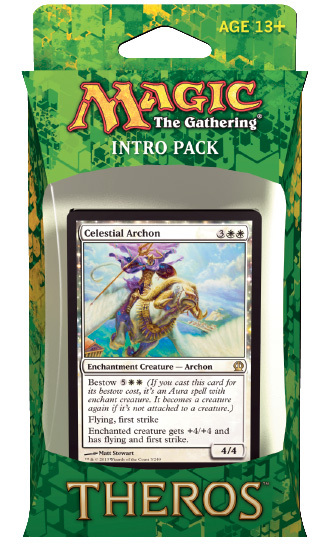 Sure, it's costly, but for 4UU, you get a 6/6 creature. 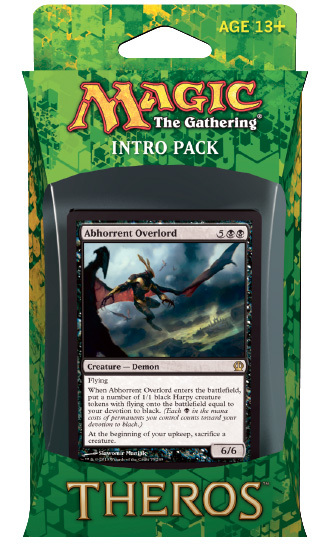 Once it is in play, you can make it monstrous by paying 6UU, and you put four +1/+1 counters on it (and it becomes monstrous, so this is a one time payment only and you cannot pay that cost again). Once that is done, you tap four creatures and they cannot untap until your now 10/10 creature remains in your control. So this is an interesting creature. It is a 6/6 black demon for 5BB, and it has flying. That is pretty normal. Then at the beginning of your upkeep, you sacrifice a creature. That's kind of typical too. BUT, then you have a sort of mechanic called "devotion to black." 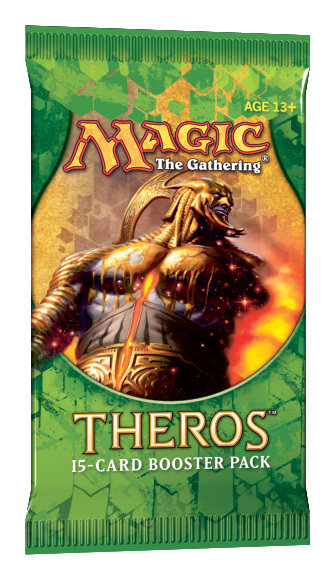 This has something to do with the number of black mana symbols in mana costs of permanents you control. 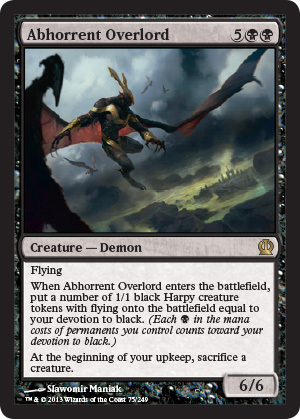 And you get 1/1 black Harpy tokens with flying equal to your devotion. So this is pretty interesting. 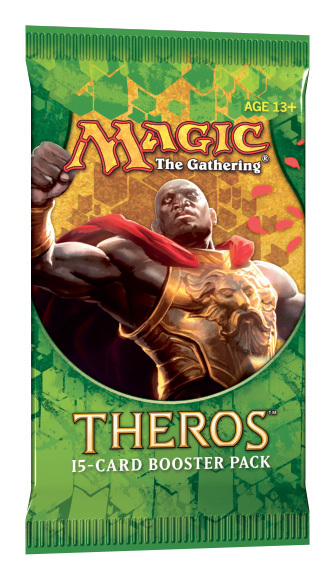 Are there more devotions, or does this only exist for black? Another card with Monstrosity... 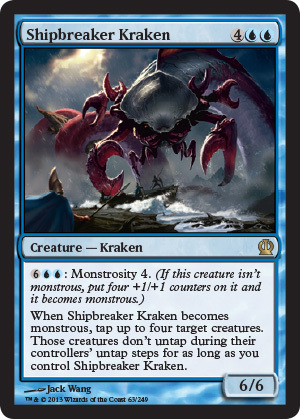 So, first we have a 4/5 creature with 2RR. Then you have the Monstrosity ability (specifically Monstrosity 3). 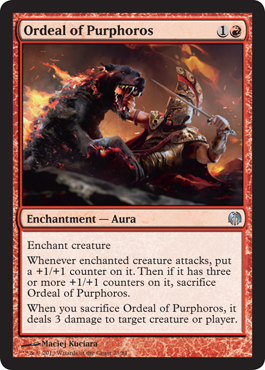 For 5RR, you add three +1/+1 counters on it, so it becomes a 7/8 creature and once this happens, each player sacrifices three lands. That's pretty cool. Maybe there will be a subtheme of land destruction and recovery. 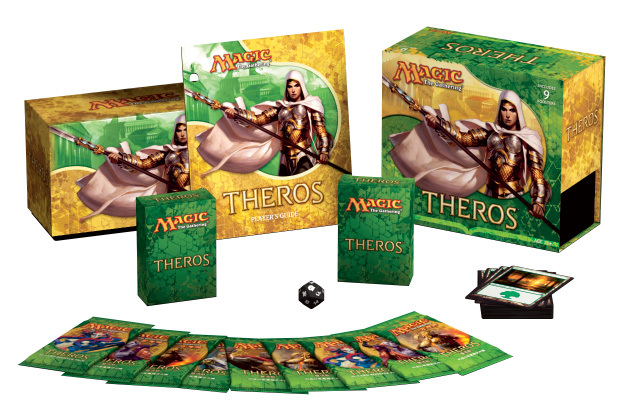 Now, we will be getting into the spoilers that will be in Duel Decks: Heroes vs. Monsters. 2GG for a 5/5 that you can then pay XXG to add X +1/+1 counters to it. 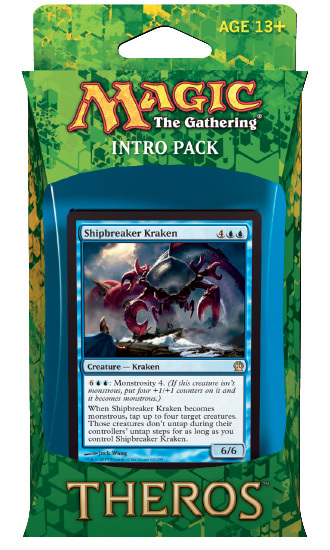 Now, when this becomes monstrous, it deals X damage divided amongst as many target creatures your opponents control, and then they each deal damage to this creature. 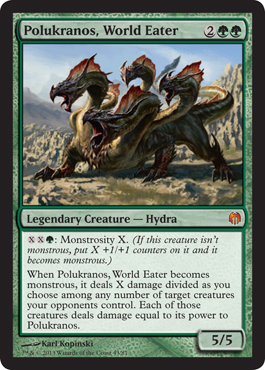 Pretty powerful, but I'm wondering how this would work without Polukranos dying. 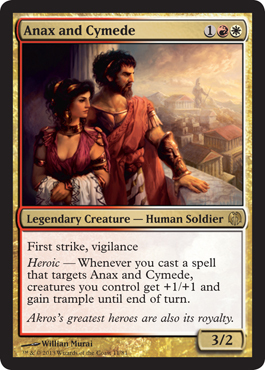 Anax and Cymede is cast for 1RW and is a 3/2 legendary creature. 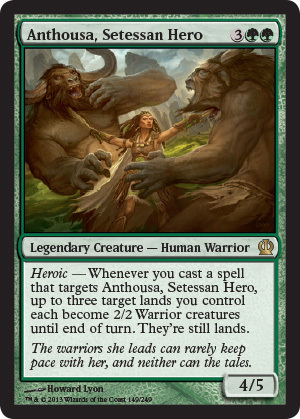 Heroic triggers when you cast a spell targeting this card, all creatures you control get +1/+1 and gain trample until end of turn. 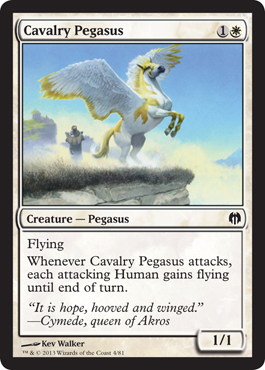 For 1W, you get a 1/1 flying creature that gives all attacking humans flying when it attacks. I think this could turn out to be a really awesome card. 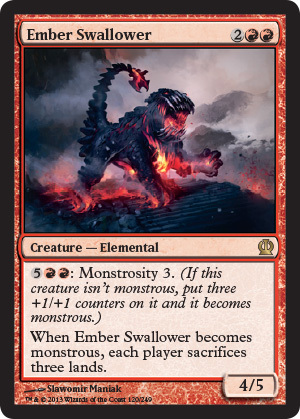 For 1R, when the enchanted creature attacks, it gets a +1/+1 counter, and once it has three of more counters, you sacrifice the enchantment. 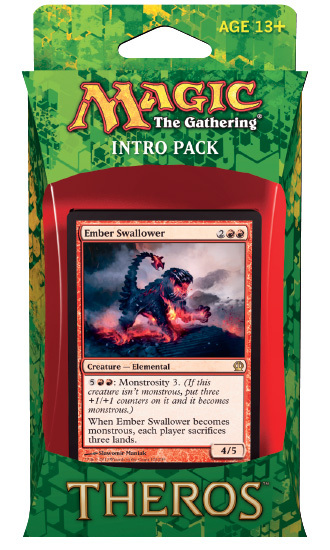 Once you sacrifice this enchantment, you can deal three damage to target creature or player. 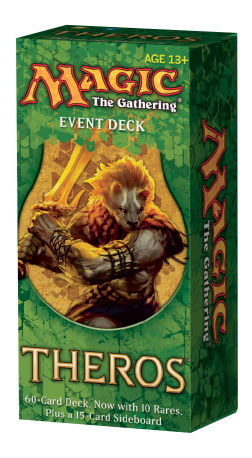 For 1G, you get a 2/1 creature where you can pay R, sacrifice this creature, which in turn adds RRR to your mana pool. Not bad. 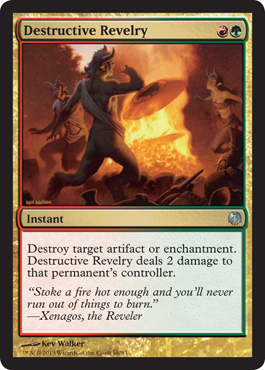 For RG, you can destroy target artifact or enchantment, which also deals two damage to the controller of that artifact or enchantment. 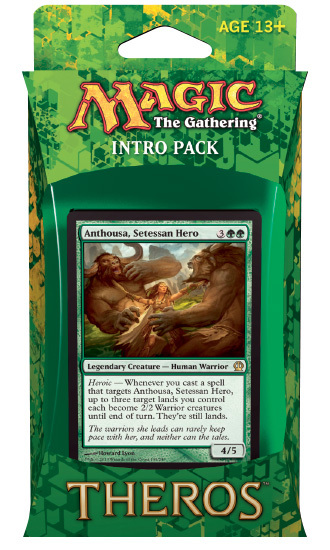 Definitely a great card like naturalize that throws in a shock.